Superficially, at least, there's nothing particularly unusual about the Sttaf, with little to distinguish it from, say, the Teufel Ultima 7, or Kudos X2. It's a simple two-way floorstander, based on a 140mm bass/mid driver with a 95mm diameter flared and doped paper cone. This is loaded by the larger, upper section of the enclosure and a rear port and crosses over using a second-order network at around 2.5kHz to a 25mm fabric dome tweeter. The devil, as they say, is actually in the obsessive attention paid to the fine detail here and that's the key factor that goes some way towards justifying the Sttaf's substantial £1,695 price tag. Enclosure construction methods are rarely given much attention, for example, but in this case the joints between the panels are made using traditional interlocking mitering methods, to give superior fit, strength and sealing. As the back panel, at least, is just 11mm thick, construction seems to be deliberately fairly lightweight, presumably to minimise energy storage. Furthermore, no damping fill could be seen within the enclosure itself, though the brochure does mention the use of borosilicate as a damping material. The column itself is stiffened by two cross-braces. The upper one is angled and perforated by large holes to maintain acoustic continuity and avoid generating focused standing waves. The lower one seals off a section at the bottom of the enclosure for the optional addition of mass-loading material. Although the manual recommends adding 2.3-4.5kg of dry sand, the distributor believes that mass loading is really only beneficial if stability is likely to be a significant issue, and that the best sound quality is achieved without any. Another unusual feature concerns the floor coupling. A small plinth is supplied, which slightly increases the lateral stability footprint and is equipped with very effective spike sockets. The spikes themselves are slightly decoupled by the use of silicone washers and the plinths are also slightly decoupled by the beads of glue that are supplied to fix them to the enclosures – an interestingly unconventional approach, but one that makes accurately lining up plinth and enclosure rather tricky. The enclosure surfaces are finished in a choice of three high-quality real wood veneers, or painted satin white, and the edges around the front and back are delicately chamfered. The connection block, set a little too high off the ground perhaps, carries two pairs of socket/binder terminals; curiously, a small piece of foam is glued in place just above the terminals, apparently in order to block a tiny 1.5mm hole and prevent it from generating unwanted high-frequency coloration. The Sttaf was primarily fed from a system comprising a Naim NAC552 preamp, with NAP500 and NAP135 power amplifiers, driven from Naim CDS3/555PS and Rega Valve Isis CD players, as well as a Magnum Dynalab MD106T FM tuner. Vinyl record players included a Linn/Rega hybrid, a Funk modified Linn with FXR II tonearm and a Roksan TMS3/Artemiz, all using a Soundsmith Strain Gauge cartridge. Cables were from Naim, Phonosophie, The Chord Company, TM Systems and Vertex AQ. You won't get deep bass or massive loudness capabilities here, of course, but those are the inevitable and acceptable consequences of any small loudspeaker. What really matters is that the heart and soul of the music is communicated properly and this is something that the Sttaf does very well. While one might fairly criticise some minor departures from strict neutrality – the overall character here is quite warm and laid-back, for example – this is a speaker that's very easy to like and always makes the music sound thoroughly enjoyable. The bass end is certainly rather strong, one contributing factor being that the port-tuning frequency (around 49Hz) is very close to a major mode in our listening room. Some mid-bass excess is therefore only to be expected and while the bottom end is not its strong point – it lacks some grip, poise and clarity – it somehow mostly manages to avoid delivering an isolated 'thump'. Although the very lowest octave isn't on the agenda, there's little evidence here of the upper bass leanness that all too often afflicts speakers of a similar size and configuration. Indeed, the generally warm character throughout the bass region is very welcome, in that it adds a surprisingly good impression of scale and weight and, therefore, compensates to a considerable extent for the lack of genuine extension. Combine that with exceptionally spacious and out-of-the-box stereo imaging, and a tonal balance that's unusual in slightly underplaying the upper mid-band and presence zones, and the little Sttaf somehow manages to sound a whole lot larger than its physical dimensions lead one to believe is possible. This is particularly impressive with choral music, since the voices are always delicate and well formed, while the exceptional cabinet control ensures very little impediment to the reproduction of the low-level acoustic of the recording venue. While some might find it a shade too laid back for their personal taste, we believe that these will be very much the minority and most will welcome the impressive sense of scale it delivers, alongside a welcome freedom from any aggressive tendencies. The top end is quite obvious, but it's also quite sweet and very well integrated, so it supplies plenty of detail, but is not in any way obtrusive. Colorations are well under control, and the enclosure is clearly doing a good job of loading the main drive unit without adding any significant contribution of its own. The fact that it's actually quite a lightweight affair, as well as properly stiffened, means that the enclosure shows little tendency to store energy. This ensures a wide dynamic range and also helps the Sttaf sound quick and lively in spite of its basically laid back character – an unusual but unquestionably winning combination. The spacious imaging will undoubtedly appeal to those who favour recordings made in a natural acoustic – choral material is particularly well served here. Indeed, the only type of music likely to catch out the Sttaf is heavy rock, where the limited ultimate loudness capability might start to become exposed. It's easy to underestimate the capabilities of a small floorstander such as this. 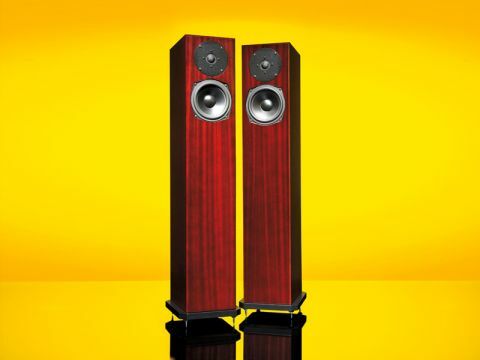 It doesn't look like a lot of speaker for £1,695, but it delivers a performance that belies its size and fully justifies its price.